Gingergrasol. - Essence de Gingergrass. Origin and Production. Only a comparatively short time ago 1)> gingergrass oil was regarded as a poorer quality of palmarosa oil, more particularly since it entered the market from Bombay and in the same kind of container. It was mostly adulterated with considerable amounts of turpentine or mineral oils, additions, the presence of which was readily recognized by its sparing solubility in alcohol, more particularly in diluted alcohol. Occasionally, however, a gingergrass oil was observed that formed a clear solution with 70 p. c. alcohol, but the odor of which was very different from that of palmarosa oil2). The examination of such an oil3) revealed a composition differing materially from that of palmarosa oil. Hence the assumption that gingergrass oil was but a poorer grade of palmarosa oil could no longer be maintained, J. H. Burkill then succeeded in clearing up the botanical source of gingergrass oil. He sent samples of oil distilled from Cymbopogon Martini, Stapf var. motia and C. M. var. sofia to Schimmel & Co., who identified the oil from sofia as gingergrass oil and that from motia as palmarosa oil4). Thus the fact was established that gingergrass oil is obtained from Cymbopogon Martini, Stapf var. sofia. (Comp. palmarosa oil, p. 179). The distillation of gingergrass oil is like that of palmarosa oil. Under the former the distribution of the two grass varieties has been discussed in detail. The yield of an oil distilled in Java amounted to 0,1 p. c.6). Properties. d15o 0,90 to 0,953; aD + 546) to - 30°; nD20o 1478 to 1,493; A.V. up to 6,2; E. V. 8 to 29 (in one case 54,5)7); E. V. after acetylation 120 to 200. Soluble in 2 to 3 vols, of 70 p. c. alcohol. Additional alcohol mostly produces opalescence or even turbidity. Soluble in 0,5 to 1,5 vols, and more of 80 p. c. alcohol. In isolated instances opalescence is observable. 1) Gildemeister and Hoffmann, The volatile oils. Ist ed. p. 285. 2) E. Gildemeister and K. Stephan, Arch, der Pharm. 234 (1896), 326. 3) H. Walbaum and O. Huthig, Journ. f. prakt. Chem. II. 71 (1905), 459. 4) Report of Schimmel & Co. April 1907, 58. 5) Jaarb. dep. landb. in Ned.-Indie, Batavia 1910, 49. 6) An oil distilled in Java had aD + 46°5' (footnote 5). 7) Report of Schimmel & Co. October 1912, 67. Composition. Our knowledge of the composition of this oil is based on an investigation by H. Walbaum and O. Huthig in the laboratory of Schimmel & Co.1). Of terpenes the following are present: d-a-phellandrene 2) (m.p. of nitrite 120°), dipentene (m. p. of tetrabromide 125°, of a-dipentene nitrolpiperidide 153°) and d-limonene (m. p. of a-limonene nitrolpiperidide 93°, of a-limonene nitrolbenzylamine 93°). Fraction 80 to 90° contains an aldehyde C10H16O, the odor of which reminds of heptaldehyde and citronellal, and the properties of which have been described on p. 432 of vol. I. The amount present is estimated at only 0,2 p.c. A slightly higher boiling fraction contains i-carvone which was identified by its semicarbazone, m. p. 153 to 154°. As becomes apparent from the high acetylation values, the bulk of the oil consists of alcoholic substances. They are contained in fractions 85 to 95° (5 mm.) and consist of a mixture of geraniol (oxidation to citral; m. p. of diphenylurethane 82°) and a dihydrocuminic alcohol (for properties and derivatives see vol. 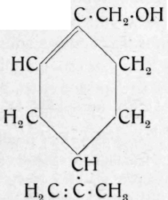 I. p. 374) the odor of which reminds of both linalool and terpineol (m. p. of naphthylurethane3) 146 to 147°). 1) Ibidem April 1904, 55; October 1904, 44; April 1905, 41; (see also footnote 3 on the previous page). 2) Phellandrene had previously been found by Gildemeister and Stephan (footnote 2 on the previous page). 3) Report of Schimmel & Co. October 1906, 40. 4) Bed. Berichte 41 (1911), 460. Adulterations. Gingergrass oil is so universally subject to adulteration that, at times, a pure oil cannot be had. Turpentine oil, mineral oil and gurjun balsam oil are the principal adulterants. All of these additions betray themselves by the lowering of the solubility, also by the change in density. Gur-jun balsam oil1) also strongly influences the optical rotation.